Posted on April 6, 2017 Categories Uncategorized1 Comment on The Answer to Life the Universe and Everything! While it does seem that robots and artificial intelligent software systems are becoming better than average humans at some tasks, for most employers they just need to be good enough as they offer several other advantages. See this Slashdot post for more. How long before AI bots get legal personhood rights? This article details a thought experiment about this. Posted on April 21, 2015 Categories UncategorizedLeave a comment on Smash the machines!? Chimps of the world unite! Chimpanzees in this study went beyond the basic tenets of the social contract and demonstrated what could be considered the foundation of social solidarity. 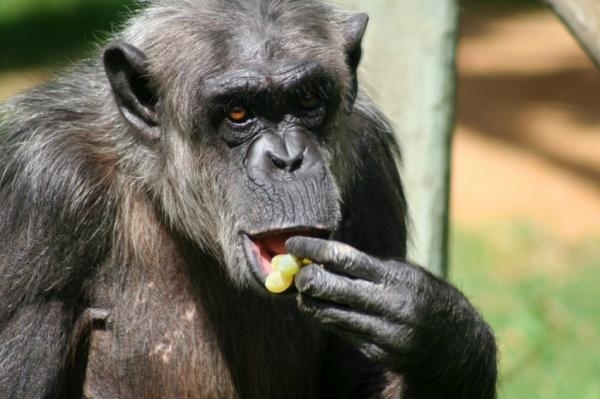 In 95 trials, chimpanzees that received a grape were significantly more likely to refuse it when their group mate only received a carrot (p = 0.008). Even those who benefited from inequality recognized that the situation was unfair and they refused to enjoy their own reward if it meant someone else had to suffer. Would you refuse the french fries if your cell mate got a low fat muffin? Not sure I would. Full article here. In a decision that effectively recognizes chimpanzees as legal persons for the first time, a New York judge granted a pair of Stony Brook University lab animals the right to have their day in court. The ruling marks the first time in U.S. history that an animal has been covered by a writ of habeus corpus, which typically allows human prisoners to challenge their detention. The judicial action could force the university, which is believed to be holding the chimps, to release the primates, and could sway additional judges to do the same with other research animals. Full article here. Posted on April 13, 2015 April 21, 2015 Categories UncategorizedLeave a comment on Chimps of the world unite!